Whether you are cruising for romantic, private sail for your wedding ceremony, honeymoon or celebrating a special anniversary, and small gathering of family members, White Dolphin Halong Cruises promise you a holiday to remember. 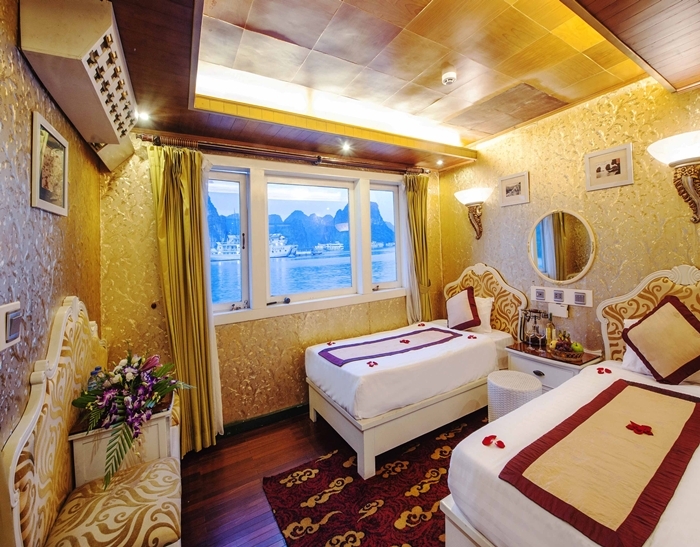 With 10 cabins set on a beautifully decorated junk, White Dolphin Halong Bay Cruise differentiates itself from the rest. The smaller White Dolphin Junk with 2 cabins, on the other hand, offer comfort and privacy for charter option. Both vessels are of comfortable and most modern equipments plus air-conditioning, and connecting door with three bay view panorama windows. Besides interesting itineraries to explore the natural wonder Halong Bay is a wide selection of on-board entertainment: mini bar with refined lounging area, upper luxury dining areas both indoor and outdoor; spacious sunbathing and relaxing area and free water sports: swimming, kayaking, and snorkeling right off the junk, which are not encouraged on a shared cruise but private chartered junk like White Dolphin Halong Bay Cruise. 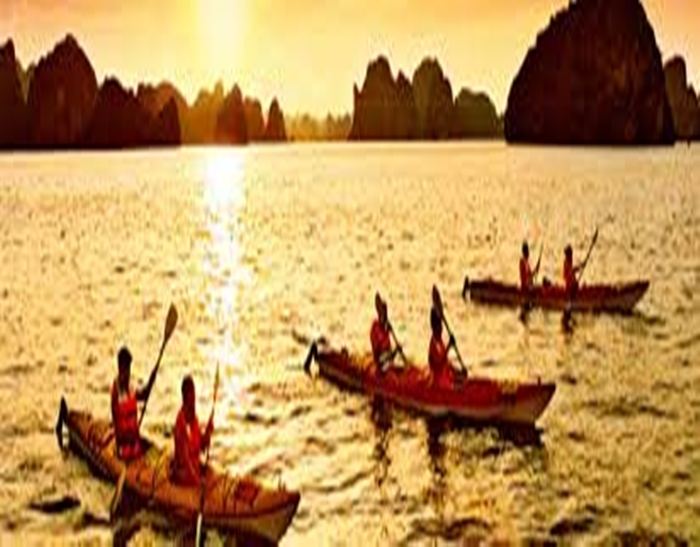 Book White Dolphin Halong Bay Cruise directly through Vietnam Eco Travel to get the best rates, big promotions and discover a different world with our luxury Halong Bay Cruises and Halong Bay Tour. 08h00 : Pick up from your hotel in Hanoi. Drive to Halong Bay. Enjoy the peaceful scenery as we travel through the countryside, farmlands and Red River delta. 10h30 : Stopover on the way for short break. 12h30 : Arrive at Hon Gai wharf . Meet the captain, crews and join us for a welcome drink, cruise briefing, safety instructions and check-in cabins. 13h00 : Lunch with fresh seafood is served while cruising towards Vong Vieng floating village, passing through extraordinary shaped-islands. 15h30 : Drop anchor at Vong Vieng: visit local houses, fish farm, schools and have a chat with the friendly fish men. (You also swim here if you like) The other option is to travel by kayak (passenger row kayaks for themselves). The kayaking option is $10.00 per person unless pre-booked. 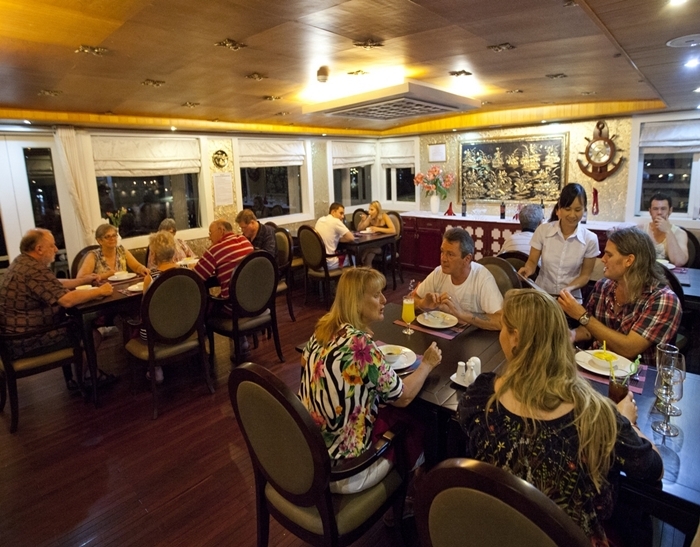 17h00 : Back on Halong White Dolphin Cruise, enjoy the sunset and continue cruising to Luom Bo for anchoring. 19h00 : Dinner is served. 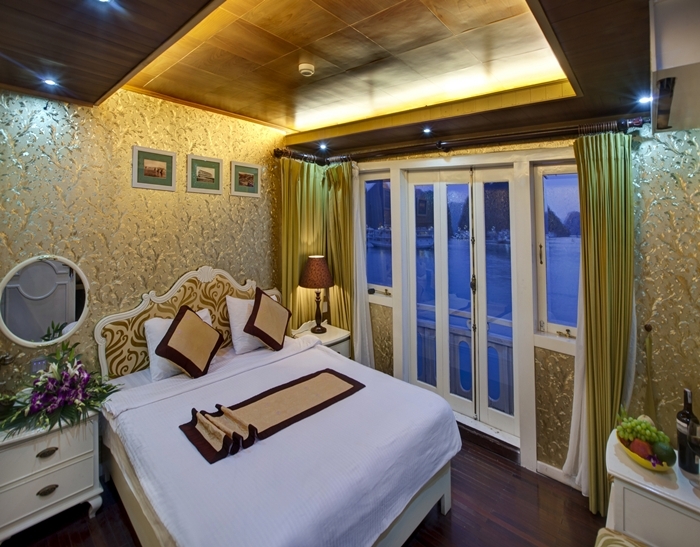 21h00 : Enjoy the comfort in your cabin or night fishing… and overnight on Halong White Dolphin Cruise. 06.30 Enjoy the bay’s morning landscape with a cup of tea or coffee. 07h30 : Lightly breakfast is served. 08h30: Explore the mystery of Sung Sot cave, one of the most beautiful caves in Halong Bay. 09h30 : Back on board, continue cruising, enjoy the stunning views of the Bay and relax. 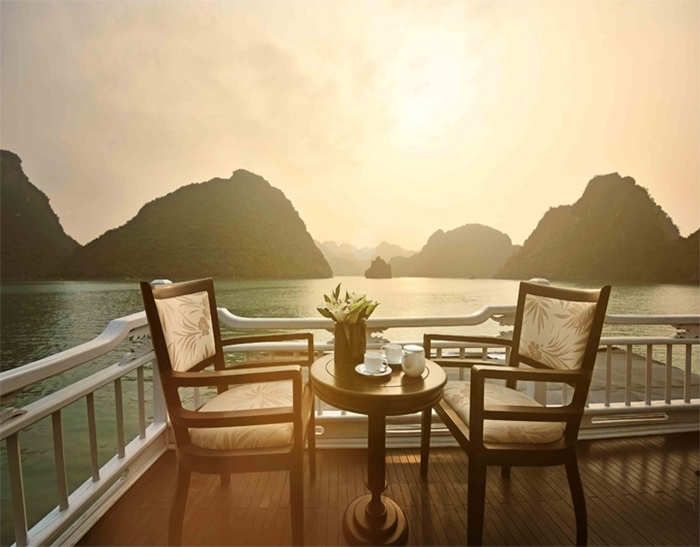 10h30 : Brunch is served on Halong White Dolphin Cruise while cruising back through Halong Bay to the pier. 11h30 : Check-out. - 12h00: Arrive Hon Gai wharf. Farewell. 12h30 : Return from Halong to Hanoi. 14h30 : Stop-over in Dong Trieu town to visit a ceramics workshop. 16h30 : Arrive in Hanoi. The trip ends. Rate in USD per cabin. 08h00: Pick up from your hotel in Hanoi. Drive to Halong Bay. Enjoy the peaceful scenery as we travel through the countryside, farmlands and Red River delta. 12h30: Arrive at Hon Gai wharf. Meet the captain, crews and join us for a welcome drink, cruise briefing, safety instructions and check-in cabin. 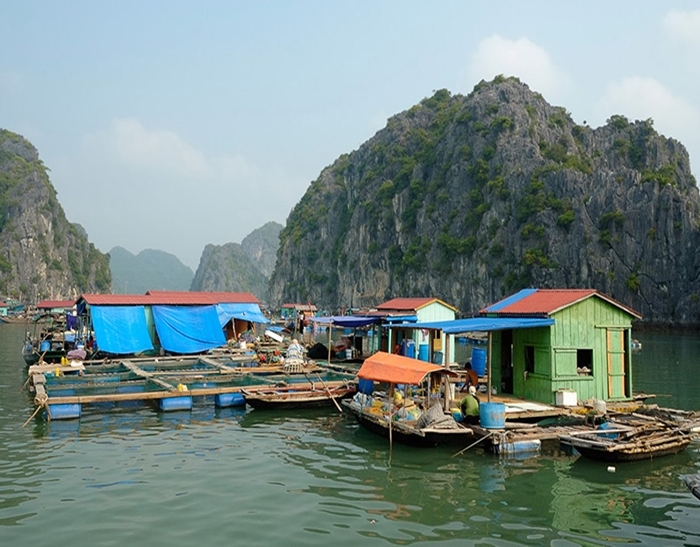 13h00: Lunch with fresh seafood is served while cruising towards Vong Vieng floating village, passing through extraordinary shaped-islands. 15h30: Drop anchor at Vong Vieng: visit local houses, fish farm, schools and have a chat with the friendly fish men. (You also swim here if you like) The other option is to travel by kayak (passengers row kayaks for themselves). 17h00: Back on board, enjoy the sunset and continue cruising to Luom Bo for anchoring. 08h00: Transfer by tender to the “Day Boat” for further cruising. 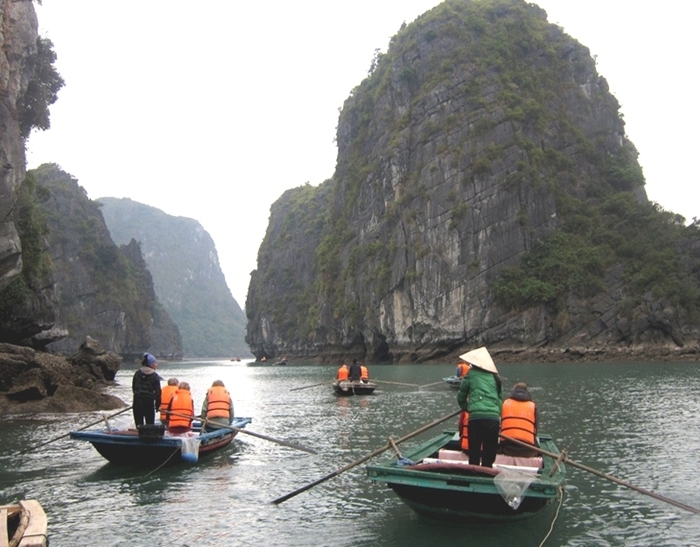 Tour guide on board will give you to some untouched areas for interesting activities. 13h00: Lunch is served on board and relaxes times. 16h00: Cruise back to White Dolphin Cruise. 07h30: Lightly breakfast is served. 08h30: Explore the mystery of Sung Sot cave, one of the most beautiful cave in Halong Bay. 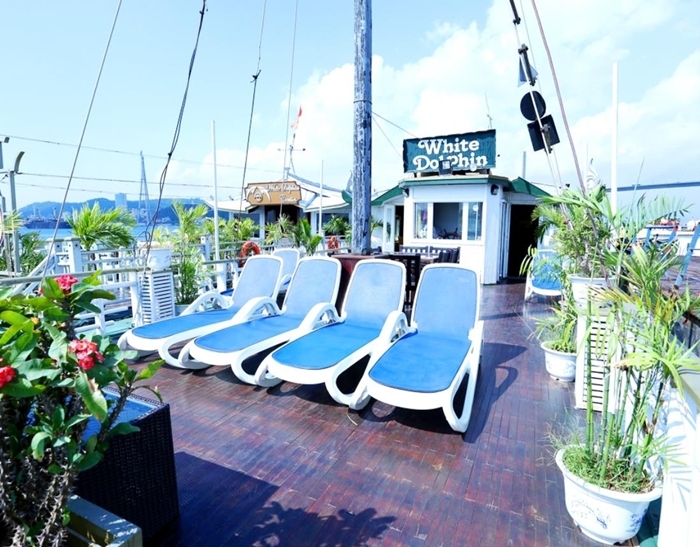 09h30: Back on Halong White Dolphin Cruise, continue cruising, enjoy the stunning views of the Bay and relax. 12h00: Arrive Hon Gai wharf. Farewell. Only one (01) child under 4 years of age sharing room with two (02) adults is allowed for FOC per cabin. From 5- 10 years old, 50% of charged will be applied. 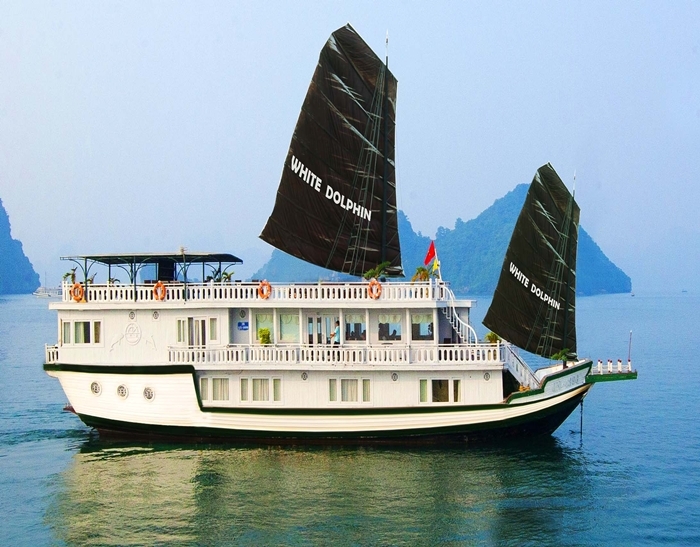 What do you think of White Dolphin Halong Bay Cruise? The 2 day 1 night trip is a must for families, we had 3 children 12,11 and 8 who just loved the experience. The staff were so accommodating, friendly and made your feel right at home. The food on the cruise was amazing!!! 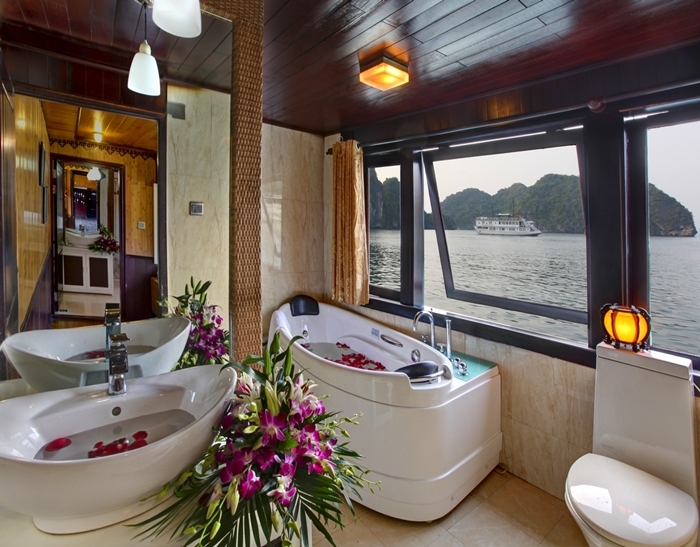 This is a must for anyone who is thinking of visiting Ha Long Bay! We were staying at an Airbnb right across from White Dolphin Cruise so we decided to walk in for more information. We booked a Halong bay tour and Halong bay Cruise for 3 to Halong Bay, which we had no idea how amazing it was. Tu the sales rep, came along with us on the tour as our guide and he was very informative and helpful the whole trip. We know it was his job to be helpful, but he was more personable and genuine, with his passion for his work. The cruise was top notch, everything was clean from inside and out. The price was reasonable for a 2 day, 1 night trip. Each room included A/C, clean sheets for the beds, shower, and etc.. The food was great, 2 lunches, 2 breakfasts, 1 dinner and a brunch i believe. Would not hesitate to book again. "Unique nature beach and itinerary with this Cruises Team"
"Ship was OK, food and guide excellent"
We sailed on Bai Tu Long Bay on a ship with only 3 cabins. The guide said he was not so experienced but he turned out to be very knowledgeable. Food was EXCELLENT. A pity that the onboard generator caused the night to be without airconditioning. The cabin was very large. Very nice experience with this company! "Really well done, and the food...."
We were a group of 5 cyclists and biking into HaLong City seeing the massive development we arrived a bit leery about the cruise. But things went smoothly tendering out to the ship and our cabins were very good. This's is an older wooden ship but it has a charm to it and is well maintained. There are 3 decks (bottom 2 are cabins) and we were bottom deck which was fine. 2nd deck cabins had sliding doors to tiny balcony rail but it doesn't seem worth it if it costs more. Pros cabins were big enough as was bathroom (bigger, really than some mega liners ) Staff is impeccably polite Plenty of hot water after swimming and well functioning AC They have the 1 day activities and meals down to a tee Lots of activities from fruit carving, to snorkeling, to cvs, fishing village, and fishing but underwater light at night. 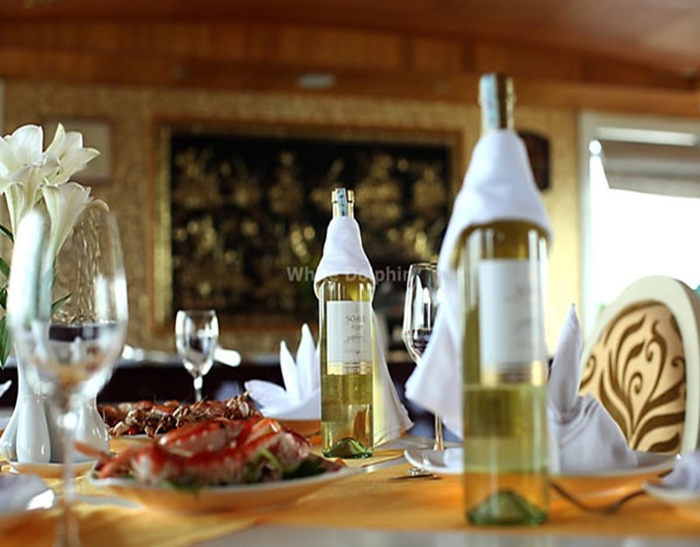 Do what you like or just drink in the gorgeous scenery *** The food is amazing and so artfully prepared. Best food we'd had in 3 weeks We all enjoyed our 24 hours and would pick White Dolphin again. don't go with expectations of Royal Carribbean... this is more like a kind of romantic, Kathryn Hepburn style Vietnamese junk.